It’s been ages since I’ve played a JRPG, especially since I rarely dabbled in the genre as a child; the only JRPGs I remember playing then was Mega Man X Command Mission and Star Ocean: The Last Hope. 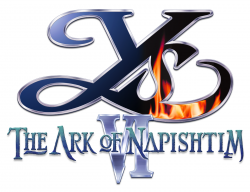 However, even though my library of JRPGs is pretty weak, when I do play such a game I end up investing a great amount of hours into them, with Ys VI: The Ark of Napishtim being no exception. 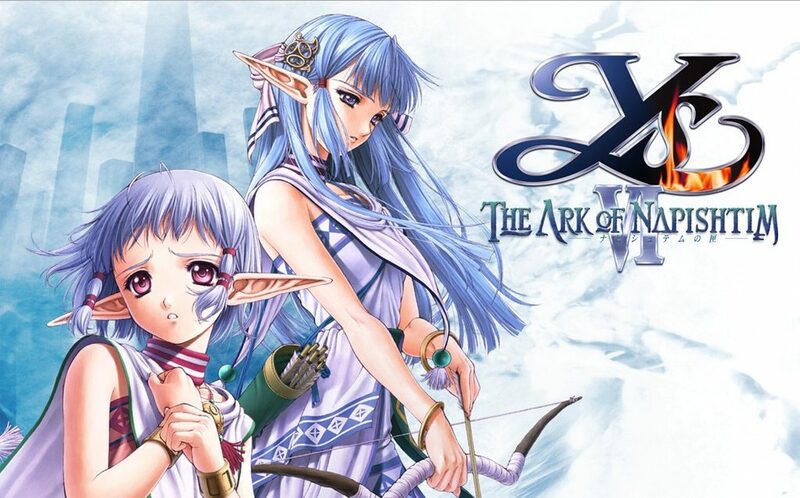 Ys VI: The Ark of Napishtim is a Japanese action RPG that was released on Windows in 2003, and which Konami ported to the PS2 and PSP years later. 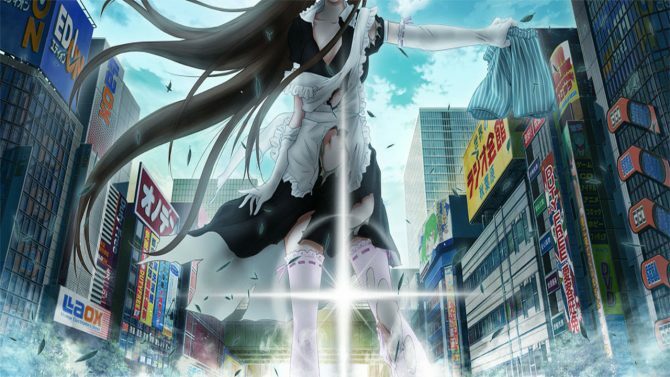 Recently, XSeeD announced and subsequently released an English version for PC. The story stars a red-head named Adol Christin (the star of the Ys series) whose ship is attacked in the beginning of the game, causing him to fall off while trying to save a friend. Adol is washed ashore and found unconscious by two girls named Isha and Olha from the “Rehda” tribe. The village isn’t exactly welcoming to strangers; people in the tribe, including the chief himself, will ask you to leave right after you’re healed since they don’t particularity like humans. 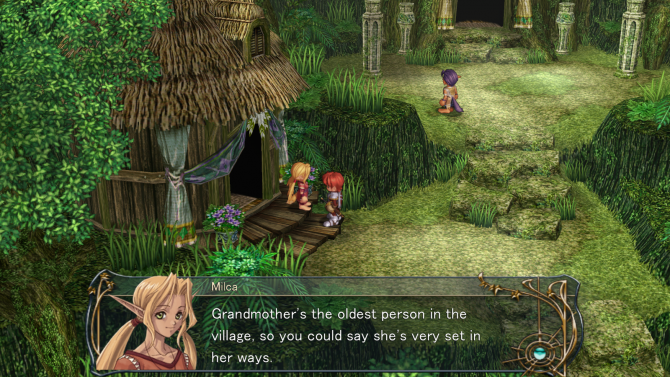 Once Adol is healed and ready to move about, his adventure begins. The story itself, while interesting, didn’t give me much to invest in since none of the characters in the game truly stuck to me. I was mostly interested in gaining new abilities, finding new items and leveling up. 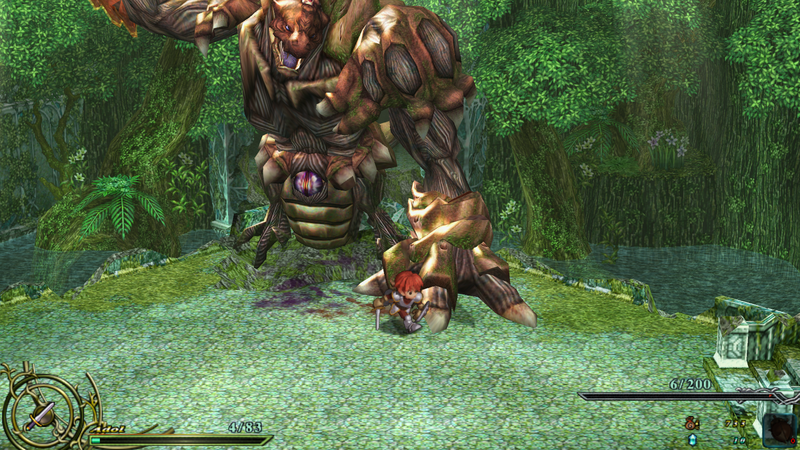 Combat is your standard action RPG fair, and the overall mechanics are somewhat similar to previous Ys title. Graphically it departs by the use of 3D models and a more “hack-and-slash” gameplay style. 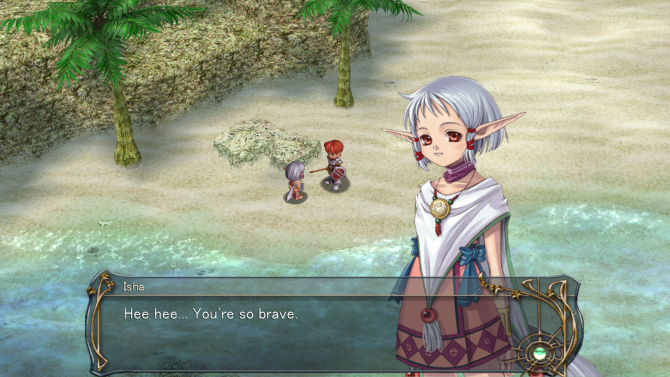 In Ys: VI you have basic movement such as freely moving your character around, attacking with an equipped weapon and using sword magic. You can also switch between swords if you have more than one on you. There are three types of attacks: the normal sword swing, the jumping swing (performed when you attack as you jump in the air) and the downward stab (performed by attacking as you fall down from a jump). Two other techniques can be mastered by the player as well. The first is the Dash Slash, carried out by a quick in the direction you want to attack and then followed immediately by an attack. The second is the difficult to master Dash Jump. By pressing the attack button, following almost instantly by the jump button, you’ll jump much higher than usual. Honestly, I wish that this mechanic was simpler to execute, especially since it becomes absolutely vital in later dungeon (with one in particular that requires it). What I loved about this game was that I didn’t feel like I was grinding to level up at all. I did some main missions and branched off to the side to find some new enemies, items, accessory expansions and side bosses. I was surprised every time I saw my character level up because I was having too much fun to notice how much I actually fought, that is until I’m reminded that there are enemies in certain areas I can’t attack until I level up enough. Throughout your adventure you’ll eventually gather three swords that have different elemental abilities: wind, fire and lighting. In order to upgrade these swords, you’ll need to gather Emel which are blue crystals that can be taken to a woman named Leav who will perform the task. You can also purchase armor and shields, as well as find and use or sell your healing/effect items you may come across, but I always kept them for emergencies since I had no incentive to really sell them. There are Spirit Monuments scattered around the world where you can heal and save your progress. Eventually you’ll find an item that allows you to teleport between these monuments anytime you want, making for excellent quick travel. The title’s music was absolutely amazing and fit well with the levels and boss fights I encountered. It never felt dull or out of place — even with all of the hours I put into this game — so that’s definitely a plus. Ys series is well-known for their high quality soundtracks so this isn’t surprising. Not to mention the graphics which, compared to the original PS2 and PSP versions, still holds up pretty well. Bosses and character models are pretty impressive for a game that was released years ago. Honestly, it was quite difficult finding any particular annoyances with the game for some time until I reached endgame and came across two glitches. The first occurred during the point in which I was escorting your companions out of a ship. On this ship there is a set of stairs that they will try to climb, but for some reason my allies kept getting stuck in an infinite climbing loop. I was forced to reboot the game five times and nearly every time they were stuck in this loop. The second issue I encountered was after I beat the game. The credits were nearly ending but the game crashed twice and I was forced to fight the final boss all over again. 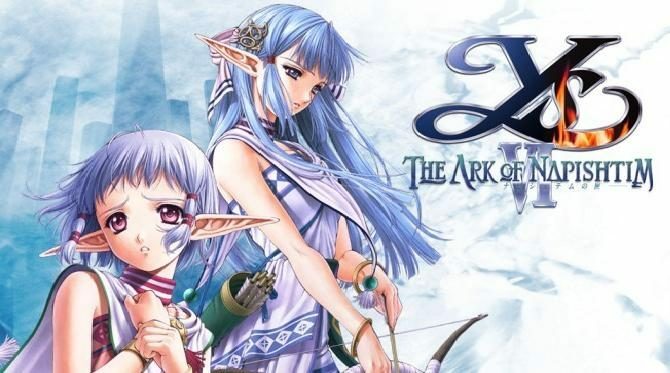 Ys VI: The Ark of Napishtim is quite the action RPG and worth a try, even for those like myself who have no previous experience of the series. Despite the two glitch issues I previously mentioned (which hopefully get patched out soon), as well as the lack of truly involving plot, Ys: VI is still a very solid JRPG gameplay-wise and worth every penny on Steam. 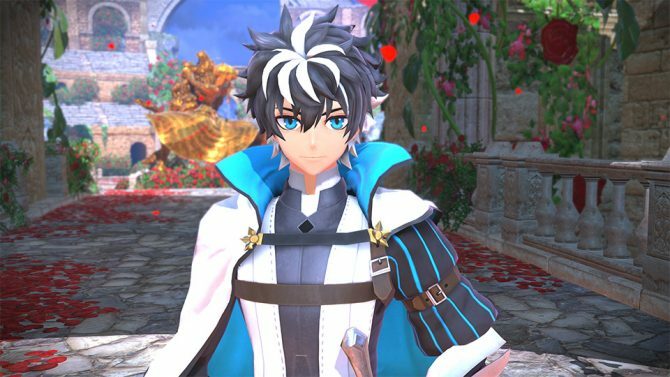 It is definitely worth a try even for those like me who know nothing of the series, and I’d go so far as to say that it would even bring in new fans to the franchise.